Buy this Rebounder (with VCD) at RM 268.00 (20% off retail) when you become a member of NewLife International. The Rebounder VCD offers a complete exercise program specially designed to improve circulation, burn calories, build bone density, firm muscles, oxygenate cells, build strength, detoxify, rejuvenate, and relax the total being – all these in the comfort of your home/office! This program is designed to be a follow-along workout for people of all ages, capabilities, and levels. It is flexible; you may pace yourself according to the level of intensity suitable for you. Join Newlife Rebound Team Shirley Kong and her friends as they lead you down the road to better health. Shirley is an experienced certified fitness instructor who received her training in UK, Australia and Singapore. It is a known fact that exercise makes you 20% more efficient at work! There are various forms of exercise. But according to modern research, one is more complete than any other. It is called Rebound Exercise. It consists of simple, ordinary exercises performed on a firm rebounder. Jogging 3 ½ miles in 32 minutes. Playing handball for 40 minutes. Swimming 800 min 16 minutes. Biking 5 miles in 18 minutes. Walking 2 ½ miles in 34 minutes. Rebound Exercise for only 2 minutes!! It is a Whole Body Exercise: Rebound Exercise is a cellular exercise. No other exercise can produce this kind of cellular cleansing and strengthening, during which every cell quickens its absorption of oxygen and nutrients, as well as hastens its process of elimination of trapped proteins and other toxins. It builds Strong Immune Systems: The lymphatic system does not have a pump system like the heart in our cardiovascular system; therefore, the lymph flow depends on the movement of the body. The gentle up-and-down movement on a rebounder activates to the maximum the one-way valves that control the lymph flow. This, in turn, propels the lymph fluids up through the body, thus increasing the immunity. In cases where movement is not possible, a person can sit on a rebounder while a companion bounces on it. It builds Muscular and Skeletal Strength: The up-and-down movement of Rebound Exercise involves the exertion of natural forces of gravity on every cell of our muscles, tissues, bones, and organs. The cells are strengthened through such stresses. The stimulating effect of gravity helps to increase the bone mass, thus preventing osteoporosis. Rebound exercise is gentle on the body. It has a clear advantage over ordinary exercises like jogging, which has a hard impact on the body that may often result in structural injuries in the back, tendon, and knees. 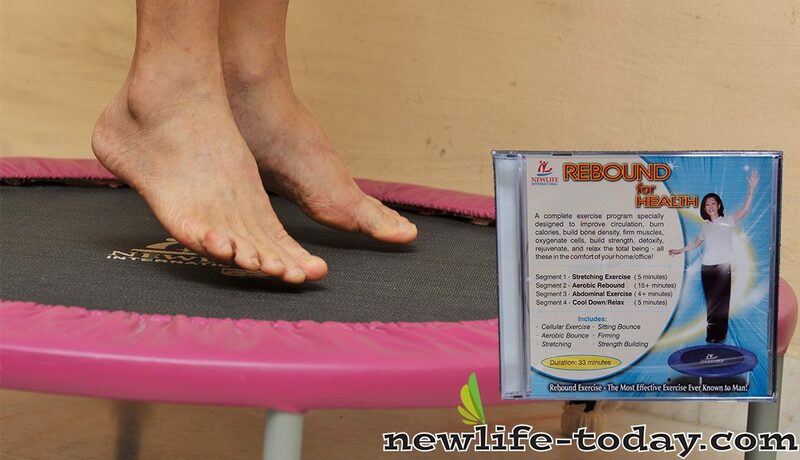 Rebound Exercise is also used in remedial exercise after accidents and injuries to help in the process of healing. It helps Learning Abilities: Educators have reported marked improvement in the learning ability and emotional stability of children who bounced regularly. Dr. G. N. Getman, the author of “How to Improve Your Child’s Intelligence,” states that everyone should be involved with rebounding. A child is never too young to start. It is ideal for Prenatal and Postnatal Conditions: Thc best and most balanced form of exercise for pregnant mothers is the ‘Health 3 Bounce’ on a Rebounder. This mild exercise will help improve body circulation, muscle strength, and bone strength in both mother and child. After childbirth, the ‘Health Bounce’ helps the mother to increase her bone mass and tone her muscles. It improves Eyesight: Rebound Exercise strengthens the ocular muscles and tissues of the eye. Janet Goodrich, in her book “Development of Perfect Eyesight Without Glasses,” strongly advocates rebounding for improving eyesight. 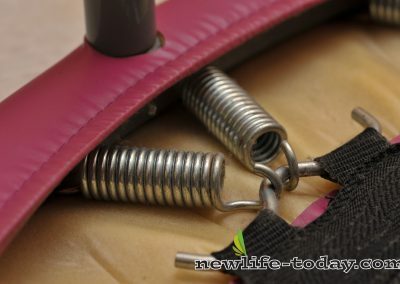 NewLife Rebounder is not an ordinary rebounder. It is a German design made according to TUV/GS standards, which is safety license issued by German authorities. All the materials including the mat, spring, and hooks that hold the mat meet the specifications of recognized safety standards. Do not waste your money on cheaper units that won’t last! NewLife rebounder carries a 3-year warranty and gives you and your family years of fun and healthy use.